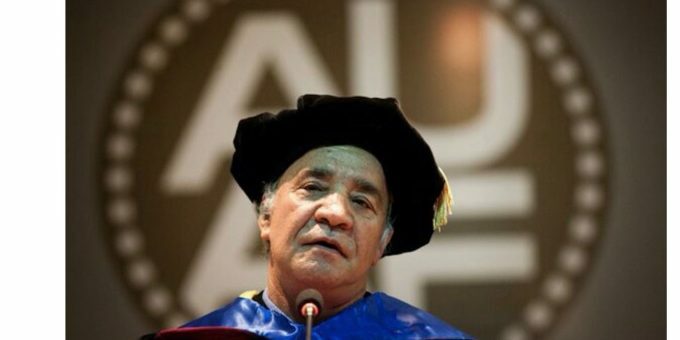 Sharif Fayez, an Afghan-American poet and academic who defined the post-9/11 structure of higher education in Afghanistan as a government minister, who went on to establish the American University of Afghanistan, passed away on February 8th in Kabul. He was 73. His death at his beloved institution, the American University of Afghanistan, was confirmed by university officials. He passed away quietly in the night, they said. Dr. Fayez was one of Afghanistan’s most honored academics and thought-leaders, appearing frequently on leading television programs and in print. A tireless advocate for advancing education as the true way to drive progress and sustainable change, he re-established six public universities as Minister of Higher Education and built the framework for higher education funding and partnerships with Asian, European, and American nations. A recipient of a highly selective Asian Foundation scholarship in his youth, he received both of his advanced degrees in the United States, which he quickly fell in love with. His time at Columbia University, the University of Colorado, and the University of Arizona cemented a deep affection for America’s open system of inquiry built on the scientific method. While impressed with technological advances, he processed cultures through their literature and poetry. His very first question to a friend in the United States upon landing in New York City was ‘who is the best American poet?’ After being handed Walt Whitman’s Leaves of Grass as indicative of the best American poetry, he read it cover to cover and pronounced simply, ‘this man was clearly reading a lot of Persian poetry.’ While scholars had long noted the similarity in lightness and tone, none had been able to prove the connection. In short order, Fayez found the missing link connecting the two – a checkout card in the New York Public library. His PhD dissertation, exploring this relationship, was published in full in several journals. Whitman had been reading Rumi to dying soldiers on the Civil War battlefield, Fayez determined. Returning to his homeland in the 1980s, he taught briefly at Kabul University, but was soon driven into exile through the purge of intellectuals under the Communist government attempting to reshape society. Crawling on his hands and knees across the Iranian-Afghan border hidden in a flock of sheep, he worked as a translator in Mashad and later Tehran, only to have to flee once more as the Iranian Revolution and later the Iran-Iraq War destroyed any chance at a normal life. A signatory to the Bonn Conference, he returned to his homeland in the winter of 2001 as the interim Minister of Higher Education and dedicated his energies to rebuilding universities, seeking buy-in from neighboring countries as well as around the world. One of his proudest achievements was re-opening the destroyed Kabul University campus after years of neglect. After his years in government, he quietly retired to a modest house in a sleepy neighborhood in Kabul to establish his dream project – an American University in Afghanistan. The project was designed so the best and brightest would never need to leave their homeland in pursuit of education, as he had been forced to do. Fayez, our gentle and brilliant Founder, will be deeply missed by the university community and all those who knew him. We honor his legacy by continuing his work to provide a world-class education for all Afghans.